We all feel nervous or anxious once in a while. The demands of everyday life can sometimes be too much and may build up. This can negatively impact your mood causing you to feel tense or anxious. Your feelings are closely tied to chemicals in your brain called neurotransmitters. 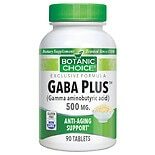 GABA is a neurotransmitter that lowers the activity of some brain cells. When GABA is released in your brain, it can make you feel calm and more relaxed. Sometimes your brain cells may not make enough of this natural stress-fighting chemical. As a result, you feel uptight and less able to cope with everyday challenges. One way to feel less tense may be to cut down on caffeine. Caffeine can make feelings of anxiety worse. Many people find that getting daily exercise can help them feel less stressed or nervous. Some studies have even shown that doing yoga may lead to higher levels of GABA in the brain. There are also some supplements thought to boost GABA levels. Supplements are vitamins, minerals, or herbs that you make take to promote health. GABA supplements often claim to help ease anxiety and stress. Studies have not yet shown if these supplements really work. GABA supplements are aimed to raise the amount of GABA in your brain. But it is not yet known if GABA taken by mouth can reach the brain to bring about any helpful changes. Some GABA supplements have other ingredients like niacinamide. Niacinamide is a form of B vitamin called vitamin B3. It's found naturally in a number of foods. Niacinamide is thought to help GABA in supplement form reach the brain to be effective. But research is still needed to support this claim. Some people take GABA supplements for other reasons. GABA supplements are thought to raise levels of human growth hormone. This hormone helps to keep strong bones, muscles and cartilage. But there is not enough proof to show this is true. GABA supplements have not been well studied. It is best to talk with your doctor first before taking any supplement. If you suffer from the effects of stress and feel anxious or down, it may be the sign of a health problem. Your doctor can help you decide what care is right for you.